Nano4 Global is a young start-up launched in 2015 to market innovative nanotechnology based molecular diagnostics. Nano4 is pioneering a new high-confidence proprietary nanotechnology platform relying on more than 12 years of research and development at Universidade NOVA de Lisboa - Science and Technology, Department of Life Sciences. Nano4 Global has a fully dedicated manufacturing lab. Located near Lisbon within a pharmaceutical campus hosting a Portuguese pharma company in Portugal. Nano4 Global manufacturing capability offer molecular diagnostic production and custom nanotechnology proficiency. 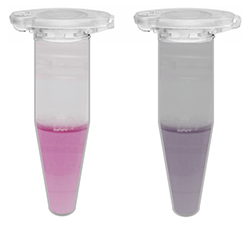 NANO4 Platform relies on a colorimetric molecular diagnostic method based on gold nanoparticles that provide fast and specific identification of a DNA or RNA biomarker. NANO4 platform provides a colorimetric molecular diagnostic method based on gold nanoprobes that allow fast and specific identification of a DNA or RNA biomarker. The friendly use of Nano4 nanodiagnostics puts forward a fast, accurate, affordable technology - the next generation of molecular nanodiagnostics. NANO4 is the next generation of molecular nanodiagnostics applied to life sciences that provides simple readout depending on the biomarker. NANO4 is an award winning technology - Santander Totta/NOVAScientific Prize. Due to the easy and simple operation, NANO4 will impact the way molecular diagnostics are performed and will lead the decentralization of molecular diagnostics - from genetics lab to point of need. BLANK Gold nanoprobes provide a visual colorimetric change that identifies a DNA/RNA sequence. POSITIVE Target DNA/RNA prevents aggregation. Solution remains RED after revelator. Gold nanoprobes provide a visual colorimetric change that identifies a DNA/RNA sequence. Target DNA/RNA prevents aggregation. Solution remains RED after revelator. NANO4 platform is extremely flexible and easily adapted to a range of applications where specific DNA or RNA sequence is critical, such as detection of human pathogens (validation ongoing for M. tuberculosis, Zika), selected cancers and other genetic diseases. Our combination of expertise in Science, industry and operations allows us to realize the immense potential of our technology. Together, Nano4 Global team accumulates more than 30 years of experience in the life sciences, from, research, start-ups to operations and management. 15 years of Leading research in Nanotechnoloy Diagnostics / Thereapeutics. Strong commitment to SMEs via EU funded instruments and joint funded projects; acting as expert for international science Boards. 12 years multi-country corporate experience in Genzyme, including Country Manager and International Management. President of Portugal’s Biotech Industry Organization, MBA and Pharma Degree. 5 years experience in clinical diagnostic in corporate environment, Founder of 2 successful SMEs, including Molecular Diagnostics Start up built upon 10 years of molecular genetics research. We always seek for strong leaders and top scientists that want to change our world.